In recent months, the British establishment has engaged in the most blatant and concerted propaganda campaign since the Scottish independence referendum or the Iraq war. Every day, the establishment spreads more fear in an attempt to keep Britain in the European Union (EU); with this propaganda campaign completely undermining the democratic process. In April, the British government spent nearly £10 million on a pro-EU propaganda leaflet which they sent to every household in the UK. Even though every-minute of every-day taxpayers’ money is wasted on killing innocent people in imperial wars abroad, openly spending approximately £10m on a propaganda leaflet is surely one of the biggest wastes of taxpayers’ money in recent years; especially in a country where Greek-style austerity is trying to be forced upon the people, and public service cuts have been a key feature of the current Tory government. 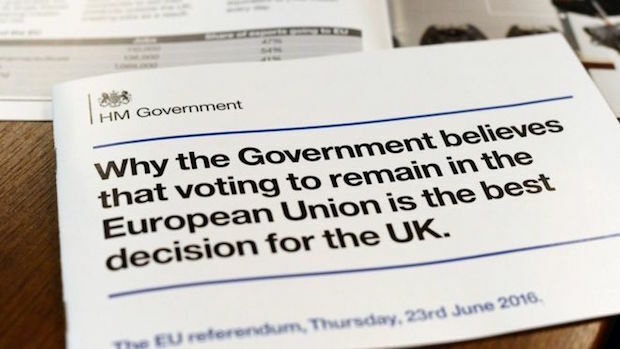 It also raises an important question: can a referendum that is called by a government be classified as fair, free and democratic, when the very same government is running a concerted propaganda campaign to coerce the citizens to vote in a particular way? In a free and democratic society, the citizenry should be allowed to vote and not be bullied and terrified into voting in a certain way. In a free and democratic society, the government should stay largely neutral and allow the people to decide for themselves. In a free and democratic society, the government serves the citizens; the citizens are not at the behest of the government. The EU referendum is just another example that democracy in Britain is merely an illusion; it has no basis in reality. Even if the government does not rig the referendum directly – there was some speculation that the Scottish independence referendum in 2014 was rigged – they have engaged in information warfare to the point that the referendum is already rigged in the favour of Britain remaining in the EU. At this point, it is highly unlikely that Britain will vote to leave the EU on the 23rd of June. Whatever your opinion is on the matter, everyone should recognise that a government engaging in a blatant propaganda campaign over an issue of this magnitude is antithetical to the democratic process. It should also be noted that the British people were not allowed to vote on whether they wanted to join the EU in the 1970s. In 1973, Britain joined the European Economic Community (EEC), the precursor to the EU. It was not until two years later that the British people were allowed to vote, after they had adjusted to the status quo of EEC membership. With a 65% turnout, 67% voted in favour of remaining in the EEC. But the central point – which is often misleadingly presented – is that the British people voted to remain in the EEC, they were never asked whether they wanted to join in the first place. A referendum in 1973 on whether Britain wanted to join the EEC may have produced a different result, yet the political elite had no interest in the wishes of the people. It is clear that the establishment wants Britain to stay in the EU, and is merely holding a referendum in order to appease anti-EU voices and maintain the façade of democracy in Royal Britannia. The list of individuals who are part of the Western establishment and want Britain to stay in the EU continues to expand by the day. Starting with David Cameron and the current government, pro-EU voices include: Barack Obama; Tony Blair; Peter Mandelson; Angela Merkel; Gordon Brown; and numerous former North Atlantic Terrorist Organization (NATO) chiefs. The European project is part of a much grander agenda by the global elite, and it is improbable that the British people will be allowed to vote to leave in June.